Golf fans watching this year’s United States Open saw a wide-open Oakmont Country Club golf course. That’s because most of the trees on the property are now gone. Over the last several years, Oakmont removed thousands of trees, restoring the famous layout to how it appeared when it first opened decades ago. Several historically significant golf courses throughout the country are also busy removing trees as a major part of their renovation projects. Keith Foster is among the golf course architects leading this trend toward restoration through removal, in addition to following the more traditional approaches to updating and improving golf courses. Foster is a former protégé of Arthur Hills, designer of Heritage Shores Club in Bridgeville. After leaving the Hills firm, Foster did several new courses himself, including the River Marsh Golf Club in Cambridge, MD. After 2001, however, Foster developed a specialty in restoring and renovating a few courses each year. 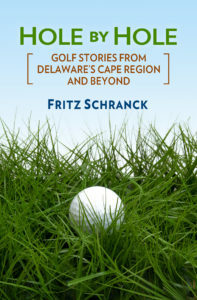 In Delaware, he oversaw the reconstruction of Wilmington Country Club’s South Course, a 1960s’ era Robert Trent Jones design. He’s also done great work at nationally famous layouts, such as Colonial Country Club in Fort Worth, TX, and the Philadelphia Cricket Club, site of a Tour of Champions major June 9-12. “I try to execute the intentions of the original architect. For example, I redid the bunkering at Wilmington in Jones’ bolder style. Redoing the course also required tree removal, in addition to re-grassing and re-greening it,” Foster said in a recent interview. 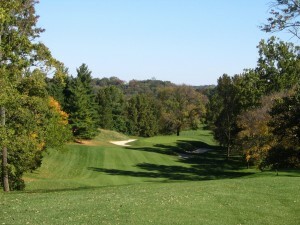 View of a hole at Moraine CC, taken in 2006. Tree removals often return golf courses to the original designer’s intent. In one instance, for example, the fairway had become pinched in to only 22 yards. Foster restored the fairway to its original 35-yard width. 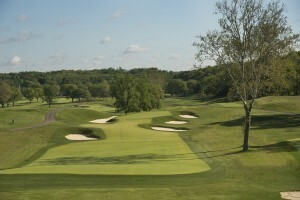 View of the same hole at Moraine CC, after the recent renovations by golf course architect Keith Foster. As he put it, no one likes to hit a ball sideways because a wall of trees blocks the direct path to the green. “It’s supposed to be a game where you hit the ball, go find it, and hit it again toward the green,” Foster said. When I asked about trees on dogleg holes, and how difficult that challenge can be for shorter hitters, Foster became even more animated: “Too many clubs were aiming at the top 1% of the golfers, and foregoing who’s really playing the course. I think course design should go for the 80% instead. You can always make a course longer for the skilled players. The challenge is to bring back the boldness that was there, and make the nature walk enjoyable,“ he said. Foster also described how he deals with tree protection/replacement ordinances, which sometimes affect how golf courses deal with tree overgrowth issues. “You also plant local trees to provide fencing at the borders of the property, and where you can, reintroduce native hardwood stands on the property where they won’t affect the golf, “ Foster said. The Cape Henlopen High School golf team held its post-season award banquet June 3. Michael Bollig won the Sportsmanship Award, and Kyle Monigle is the Most Improved Undergraduate Player. Jack Ashby and Matt Zehner won the Captain awards, and Zehner was the season’s MVP. Head Coach Claudio Smarrelli thanked the local courses that helped the Vikings, including Midway Par 3, American Classic Golf, Rookery North & South, Kings Creek CC, and the home course, Rehoboth Beach CC. The Stephen R. Lett Scholarship Fund awards deserving high school graduates with $2,500 per year for four years, based on a record of leadership, community awareness, and academic discipline. The Lett’s Play Golf Tournament, held this year on July 29, is the primary source of the scholarship money. The popular event at Kings Creek Country Club usually attracts over 100 golfers for the daylong event. This year, the Fund is making two awards for the first time. Lewes resident Sarah Koon, a Worcester Prep honors student, will attend the University of Delaware’s Engineering Honors program. Nathaniel Vincent, a three-sport athlete at Delmar High School and a 4-H Junior Leader president, will be going to Harvard. For more information about the Fund, click on the link above. The Kings Creek Ladies 9 Hole group played its Criers game June 15. Judi Pezone won first place, with Carole Ellison in second. Valerie Evans took third place, with Kathy Nave finishing fourth. Jeanne Drake won closest to the pin on the fifth hole. Sussex Pines CC held its Member/Guest tournament June 13. Susan Brady, Debbie Corrado, Brenda Lewis, and Darlene Clarke won first low gross, followed by Madelyn Macklin, Retta Rose Frampton, Janet Griffith, and Cinda Allison. Mackllin and Elayne Majors also won straightest drive, while Lewis and Frampton were closest to the pin. Susan Shockley, Kathy Hudson, Kim Brooks, and Sharon Boyette won first low net, with second going to Sandy Harrison, Faye Slatcher, Hazel Pusey, and Diane Simpson. Boyette and Barb Willin also won longest drive. The group then played a low gross/low net game June 21. Linda Townsend won low gross, with JoAnn Foster in second and Susan Brady in third. Shockley won low net, while Kathy Hudak took second and Harrison finished third.